In this blog post, we’ll outline why performance marketers should optimize for mobile, the risks to watch out for when optimizing, and what to do now to get started. 40% of visitors leave sites that aren’t mobile-friendly. That’s right. 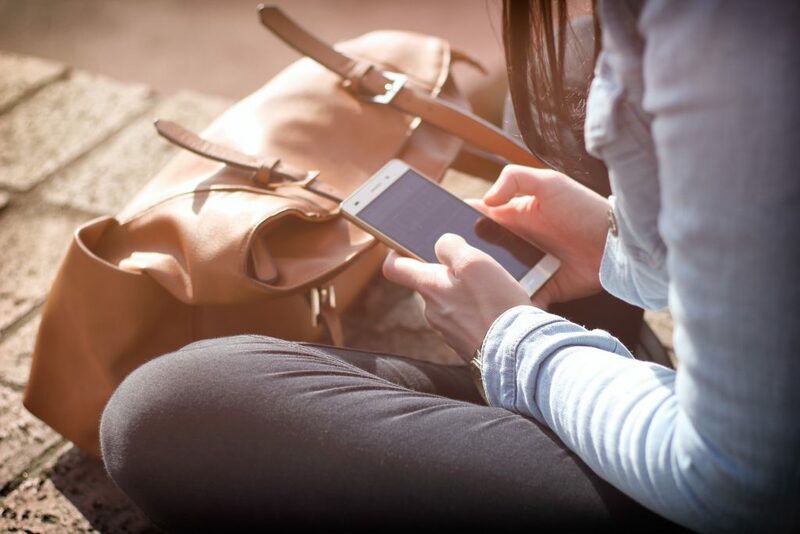 A 2013 SurveyMonkey study found that a full 40% of mobile viewers will exit and find another website if the first site isn’t mobile-friendly. Browsers also avoid mobile slackers: Google dings websites that aren’t mobile-friendly, and penalizes those that take longer than one second to load. Ouch. 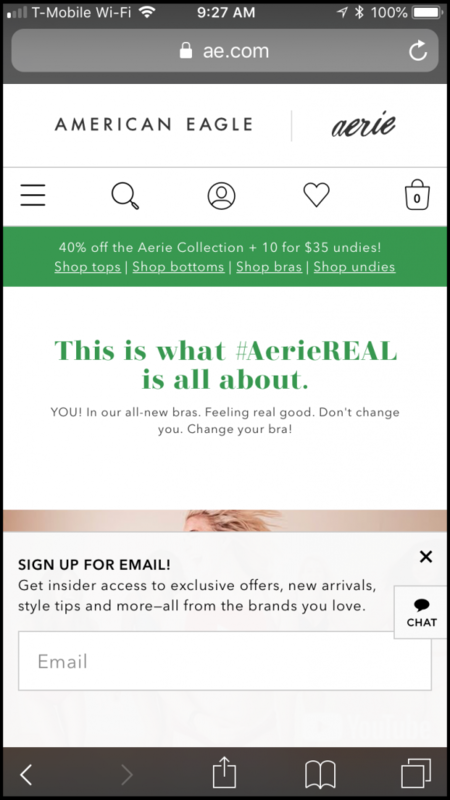 American Eagle is a standout example of mobile optimization in affiliate marketing. 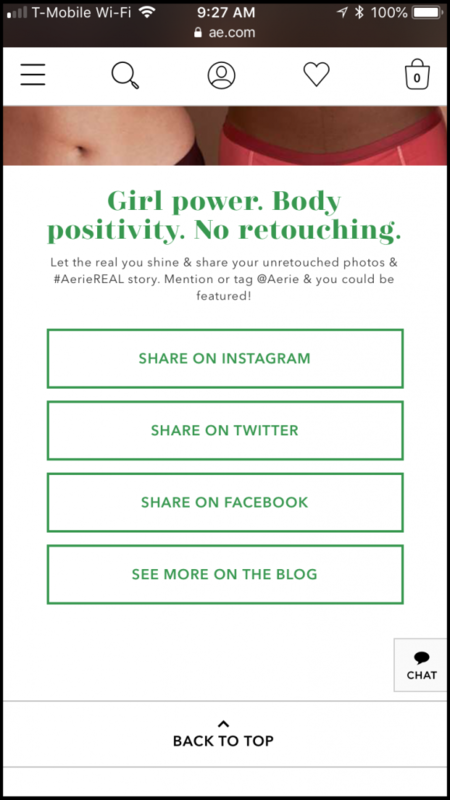 They created an influencer campaign featuring women of all shapes and sizes, with no retouching and the hashtag #aeriereal. Audiences can look up the campaign via the hashtag, and when they do, they are directed to a completely mobile-optimized site. You’ll notice below that instead of a full navigation bar, there are a few clickable icons at the top. The videos and images load immediately because they are sized correctly for mobile, and there is just enough copy to get the message across without the reader having to scroll through a static, made-for-desktop page. 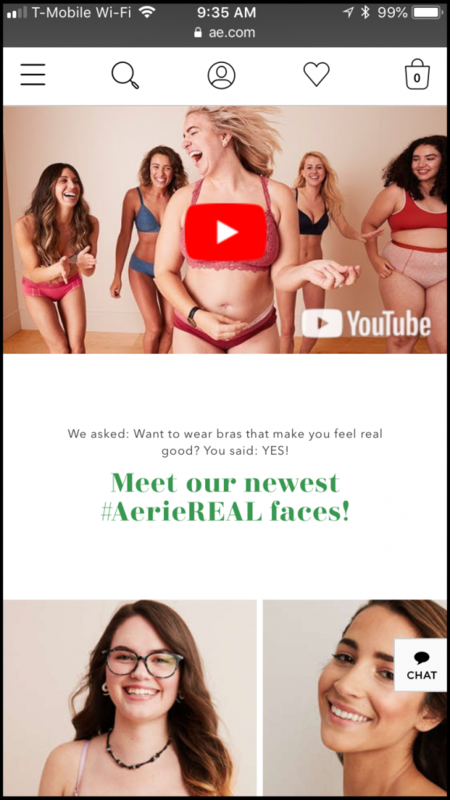 An example of mobile-optimized affiliate marketing from Aerie, part of the American Eagle Outfitters company. Simple landing pages and navigation lead users to the most important aspects of the campaign. Big buttons make sharing easy. When optimized for mobile, images load quickly and videos play without lag. Conversion rate declines 27% with slow page load times. 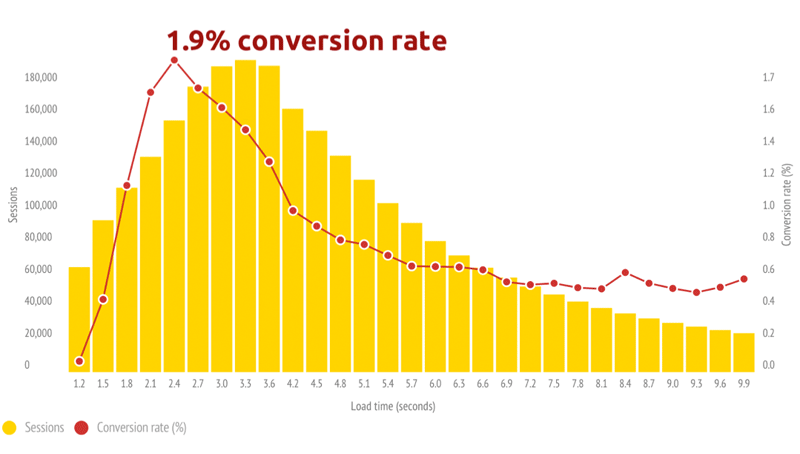 Speaking of load times, desktop conversions can be 50-100% higher on pages that load quickly. A 2015 Soasta case study revealed that a website with a 2.4-second loading time had a 1.9% conversion rate, whereas desktops with faster load times had conversion rates closer to 3%. And pages that took longer than one second to load experienced a (heartbreaking) 27% decrease in conversion rate. What to do: Take steps to reduce page load times, either by decreasing image sizes or removing plugins that bog sites down or often cause problems on mobile, like Flash. 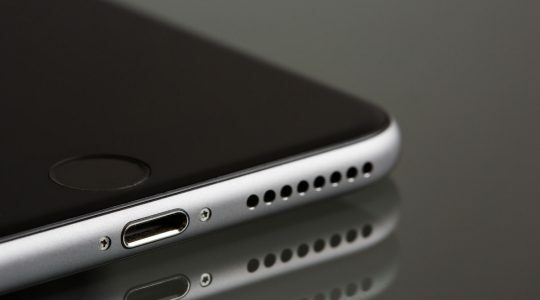 Desktop and mobile content performs differently. Because most of us spend our days working on desktop computers, it’s tempting to focus too much on what looks good on larger screens, and forget about what looks good on smaller ones. Compared to desktop, mobile is an entirely different beast, and can rearrange how elements appear and react on a page. This can confuse visitors and increase friction in your funnel. What to do: Always review and test your campaigns on mobile as well as desktop. Make sure the copy is readable on all screen sizes, the graphics scale well, the CTAs are clear and clickable, and there isn’t information overload when desktop translates to mobile. Some creative elements don’t translate across devices. Speaking of graphics, it’s important that you’re giving care to each piece so that it feels native to the platform it appears on. What works in a Facebook newsfeed ad on desktop might cut off important elements on Instagram, for example. What to do: Treat each piece of creative as its own. Resize and test to make sure each one looks like it belongs on the sites you’re featuring them on. Take the example below. 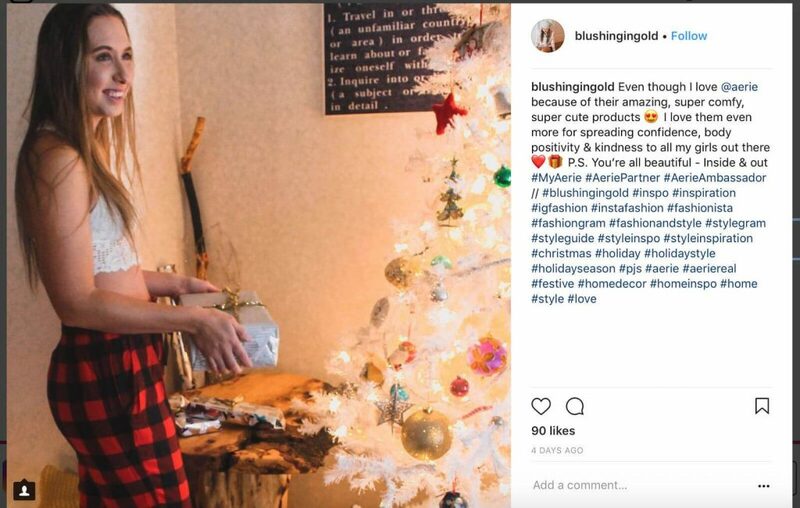 The influencer uses a cropped image for her Instagram content, but full-size versions for a full blog post review. 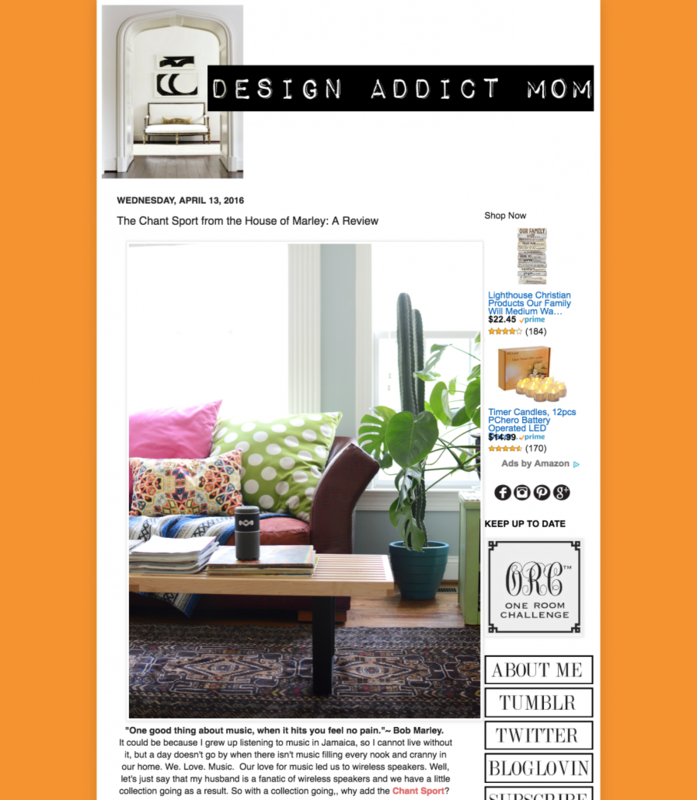 This optimization example uses full-size images on the blog, but cropped ones on Instagram. Mobile attention spans are shorter. With desktop, you can have multiple windows open and jump between them. But depending on the mobile device, audiences may only be able to view one page at a time, so they have less patience for pages that don’t get them exactly what they’re looking for. It’s important not to overwhelm visitors on your landing pages or websites, so remember to KISS: Keep it simple and straightforward … or simple, stupid. What to do: Keep landing page forms short. Ask for as little info as you can get away with, like email address and name, so users don’t get fatigued filling out multiple form fields. This can lead them to abandon your site. Reduce their temptation to leave your landing page by removing nav bars, side bars, or other elements that could distract visitors and pull them away from your form. A single CTA is the best way to keep visitors focused on completing the task at hand. Publishers may not be mobile-optimized, even if you are. After all your work to optimize your campaigns for mobile, it doesn’t necessarily mean your affiliates have done the same. You could work with them to create compelling copy and content, but if it ultimately leads your audience to a site they will bounce from, your efforts are in vain. What to do: Convincing an affiliate to overhaul their website is unlikely, so it’s best to do your research when vetting affiliates, and choose ones that are already mobile-optimized. 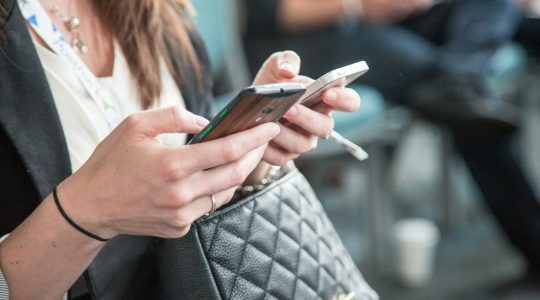 If you’re prepared to go full-in on mobile with your affiliate marketing campaigns, you’ve got one of the most important pieces covered. 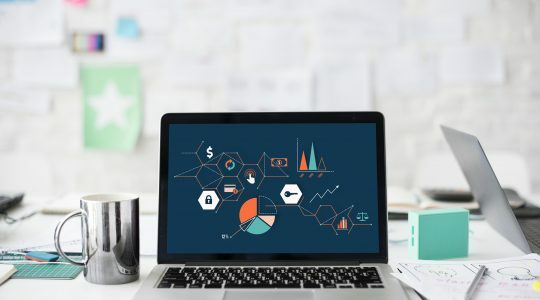 To learn more, check out our articles on how to set up your first affiliate marketing campaign or check out everything you need to know about influencer marketing.